John Bouvier gave America and the entire common law world a spectacular and timeless law dictionary. 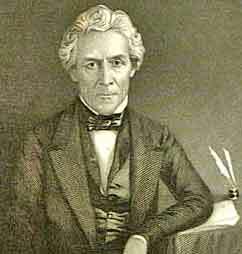 John Bouvier was born in Codognan, Southern France in 1787, his family firm adherents to the Quaker faith (called Société des amis or quakers). Bouvier attended school in Nimes. "As a result of his fortune, Jean Bouvier was one of the principal men of his village, occupying at one time or another almost all of the village offices. However, when he attempted to feed his friends and finance relief from the distress occasioned by the French Revolution (with which he sympathized), a series of misfortunes crushed the family. Thus circumstanced, Jean and Marie applied for passports to America in 1800, finally making the voyage in 1802 with their two sons, John and Daniel (c. 1795-1825). John's father died less than a year later, while his mother returned to France and died in 1823." When he was 15, he, his mother and his father moved to the city of Philadelphia, United States of America. In 1810, he married , Elizabeth Widdifield, the daughter of a prominent Philadelphia Quaker, with whom he had one child. The daughter, Hannah Mary Bouvier(1811-1870), later became a well-known astronomer. In 1812, he took the oath of citizenship to his adopted country but his French origin opened his mind to the value of writing down the law as a civilist, and to the prospect and utility of a comprehensive treatise on local law as Robert-Joseph Pothier had done. By about 1814, he had settled in Brownsville, Pennsylvania and stated a newspaper, the American Telegraph. He also undertook the study of law and immersed himself in the works of William Blackstone and Edward Coke. In 1818, he was admitted to the practice of law, as a lawyer, Court of Common Pleas, Fayette County, Pennsylvania. In 1823, he returned to Philadelphia and published a first law book, an abridgment of Blackstone's famous work. Practising law for over a decade, Bouvier was appointed Recorder of Philadelphia in1836 and was called to the bench of the Court of Criminal Sessions in 1838. "The English law dictionaries - based upon the jurisdiction of another country, incoporating peculiarities of the feudal law that are to a great extent obsolete even in England ... and totally omitting the distinctive features of our own (American) codes - were manifestly insufficient on this side of the Atlantic." "... endeavors to get forward in his profession were constantly obstructed and his efforts for a long time frustrated for want of that knowledge which his elder brethren of the bar seemed to possess." "A Law Dictionary Adapted to the Constitution and Laws of the United States of America and of Several States of the American Union With References to the Civil and Other Systems of Foreign Law ." Sales were brisk and Bouvier published further editions, a 2nd in 1843 and a third in 1848. But even at that, he managed to write and publish a 13-volume Index to Mathew Bacon's New Abridgment of the Law, between 1842 and 1846. In 1851, he completed the Institutes of American Law, a 4-volume set. But the work exhausted him and he broke down and died in Philadelphia on the 18th of November, 1851, at the age of 64. This prodigious legal writer burned the candles at both ends, known to start his day by rising between the hours of 4 and 5 am and retiring at 1 AM every night. His work took hold in his profession and the law schools. United States Supreme Court decisions began to refer to it as of 1847. He died fully expecting to publish further editions as copious material was found in his office. His estate was able to put out a 4th edition of his Law Dictionary in 1852. Many editions followed such as the "new edition" of Francis Rawle in 1897, with the book sporting a new succinct title: Bouvier's Law Dictionary.